We all need to declutter, right? Then I try to figure out what to get rid of, and I get stuck! I glance through my stuff and I can’t see anything that needs to go. It’s a dead end. If you’ve experienced a similar situation, I have help. 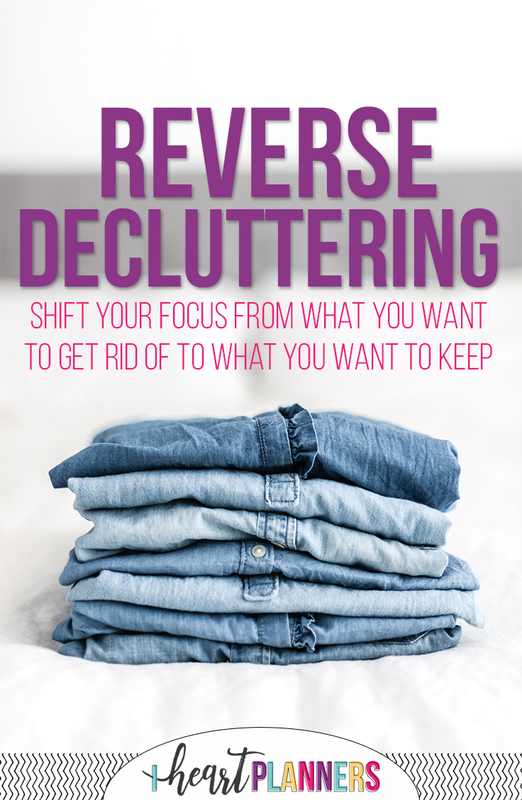 Instead of looking around your space to identify what to get rid of, you focus on giving each item a permanent home. In the course of doing this, you will naturally find several items that you don’t need. It shifts the focus from what you want to get rid of to what you want to keep. Also, if there isn’t a home for an item, it needs to go. If you really want to keep it, you’ll have to remove something else to give it a home. Plus it’s so, so much easier to keep your home tidy when everything has a clear home. If I were moving soon, would I keep it? Would I purchase this again if I didn’t already have it? That’s really all you need to ask. If you don’t use it or love it, then it needs to go. This is really just making room for the things that you do use and love. Imagine if you were surrounded only by things that you use regularly or really make you smile. Sentimental Clutter: These are things we are tempted to hang onto because someone special gave them to us, because they remind of something special, or just because we feel like we should. I’m not opposed to some sentiment, but if we hang onto everything, it loses its value. If someone gave you something that you don’t need, it won’t do them one bit of good for you to keep storing it. Better to appreciate the thought behind the gift, and pass it on to someone who will use it. For items that trigger memories, consider keeping and displaying just a few items, then photographing the rest. A photo takes up less space, but lets you keep the memory. Aspirational Clutter: These are things we wish we used on a regular basis, but we don’t. This would be things like scrapbooking materials for the scrapbooks you plan to create “someday” or exercise equipment that you haven’t touched. These are emotionally difficult to part with because we have to face the fact that we aren’t going to complete those scrapbooks or that we don’t exercise regularly. However, facing these things can be incredibly freeing! I recently got rid of all my rubber stamping supplies. I used to enjoy making cards. I wish I had time to regularly make cards, but I don’t. All my free time and creative energy is spent on the blog and Etsy shop, so I needed to part with some other hobby items. I honestly just felt free after I got rid of those things. I no longer had to feel guilty for not using those items, and I’m sure someone else can enjoy them. Expensive Clutter: It’s hard to get rid of things that cost us a lot of money. However, even if something was expensive, but we’re not using it, then getting rid of it is simply admitting the truth. It was already a bad purchase. Getting rid of it won’t change that. I Might Use This Someday Clutter: There are many items we have that we might possibly use someday. Don’t keep those things!! Yes, there could be a situation in 5 years where I would need the 12 three-ring binders from my college days, but it’s not worth the cost of storing them all those years. If I really need them, I’ll just purchase new ones. Ninety percent of the time, you will never actually use those things. It’s worth the small cost for the ten percent of things you would have been able to use. Also, if you keep everything you might use someday, you may not be able to find what you need when you need it and be forced to repurchase it anyway. Aspirational…yep, finally let go of that stuff. Had a scrapbook from when my oldest was born that’s never been touched. 12 years. It was gifted to a group of women to make a memorial book about a coworker. It feels good to give it to a purpose than to just put it in the donate pile. Thank you for your comment, Kristen. I have baby books that are not finished for any of my 3 children. I seriously have an enormous amount of guilt attached to the fact that I am such a failure I could not even fill in a baby book! I am glad to know I am not alone. Try again and if that doesn’t work, please email iheartplanners@gmail.com for help. Especially because I usually end up making a huge mess when I declutter. This is organizing and decluttering all in one! I definitely agree with previous comment from Kirsten. Aspirational clutter! Before my baby was born I bought a whole lot of Project Life supplies. And I finally admitted recently that I just don’t have time for that. Sad, but we can’t do everything. Pretty much all my clutter is in the “I might use this someday” category! After reading this, I’m feeling inspired and ready to get rid of (most) of it!!!!! Thanks so much! Totally I started asking myself – If I lost this item, would I buy it again? And if the answer was no – then it was a serious contender for the give away/chuck pile. As I’m downsizing and need to clean out a lot of items this article was so helpful. Loved it! Passing it on to my kids. This is such a helpful post! 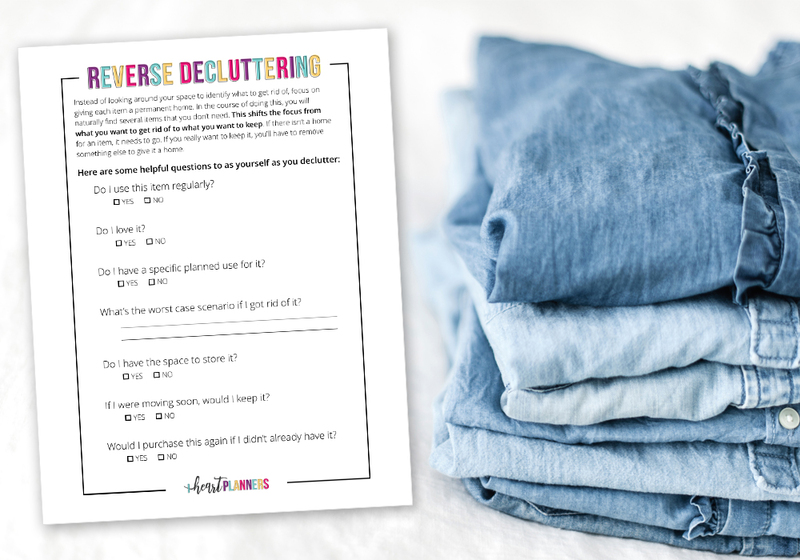 It’s so easy to make a huge mess when decluttering, but this method combines organizing and decluttering! Genius!! I also have to agree with the previous comment from Kristen regarding aspirational clutter. Ouch! When my baby was born, I bought a stack of Project Life supplies. And I’ve just recently managed to admit to myself that, no, that just isn’t going to get done. I’ve found a simpler way to document memories and store photos. Thanks for the reminder that we don’t have to feel guilty. I bought project life baby stuff also, and got rid of it when I realized I wasn’t going to do it. This may be the best explanation I’ve read on dealing with decluttering ive read, and I’ve read a lot!! The way you talk about the smaller, harder areas and your wording of it was just great!! I fortunately haven’t had to deal with a lot of direct questions, but I think you’re definitely on the right track with not feeling guilty and just being honest. 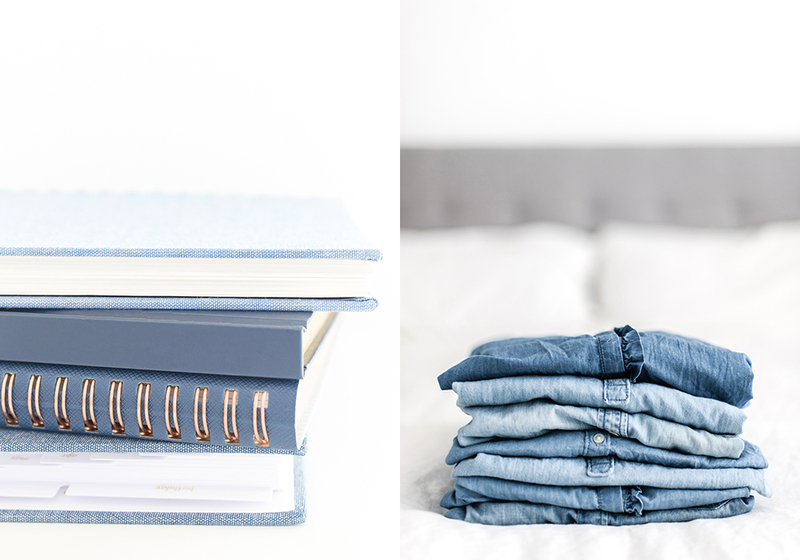 This article has inspired me to start organizing and decluttering in the morning! It is the best one I’ve read in a long time. I need order around me to operate at my best. Actual organizing and decluttering my items gives me a sense of calm, peace and hope—hope to accomplish more. T.I.M.E. is the problem.